An Australian man has been arrested over a video that allegedly showed him deliberately driving his car into several emus. The footage caused outrage after surfacing online earlier this week. It prompted a nationwide effort to find the perpetrator. On Friday, police in Victoria said a 20-year-old man faced several charges of animal cruelty. Animal welfare authorities condemned the incident as "horrific". 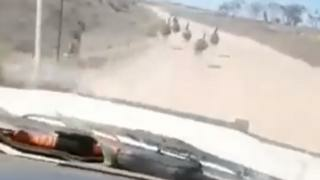 In the video, the driver is heard cheering as he strikes the birds on a dirt road with his car. "This is great - I've got that one too, and that one," he says. Police said the footage, which shows the driver's face, was filmed in Cowangie, a town about 500km (300 miles) north-west of Melbourne. The man will face a court hearing in November.